Madrid was nothing but a backwater Castilian village of 20,000 until Felipe II decided to make it the capital of his new kingdom in 1561. Since then it has flourished to become the major European capitol it is now, and what a beautiful city it is. 3 million people live here and since it is 2165 ft above sea level it has been called "Madrid de los Austrias." Muhammad ben Abd al Rahman built a fortress here he called Magerit just above the Rio Manzanares, the river that runs through here. Alfonso VI of Castilla took the city in 1083 and replaced the Magerit with a Gothic palace which burned in the 15th Century. In 1734 it was replaced with the Bourbon Palace that is now called the Palacio Real. Juan Carlos doesn't live here, it is only used for state occasions such as the special holiday of Oct 12, Columbus Day. The large Mercado De San Miguel (photo) is near the Plaza Major and in the Plaza is the Casa de la Panaderia which has frescoes painted on its walls (Photos). I woke at 9 and forced myself down for breakfast with Irene and Dimitrii because they were leaving at 10 to fly at 11 to Mallorca for the PRL course. I then worked on the computer from 11-1:30 in the room. At 2 I walked down to the internet place and sent out Chapter 40 and went through a little email. At 3 we called the dealer about the BMW and they told us they won't know anything until 5-5:30. So at 4 we walked over and toured the Catedral which is unusual because it is spectacular like all the others but it is done in a totally modern style, which is very nice. There is a special side altar there with a statue of the founder of Opus Dei. We meandered over to the cafe region in Plaza Oriente and had a cap and tea at La Botilleria. While Marcia went back to the room to change, at 5:30 I went to the internet again resending the photo zips #33-38 for about an hour. Marcia waited for the car to arrive and found that the insurance didn't pay them and we could not use a credit card; just great. We had to change $700 in travelers checks into pesetas (at a loss of $60) to pay for the repairs in cash. Gladly the window is replaced and the damage to the metal part of the window has been fixed - it looks like new. At 6:30 I went for my run down to Plaza Isabel II and on to Plaza del Sol. Again I looked at every single store in Plaza Mayor and can not find the restaurant El Cuchi. After returning, we went to the Beer Station at 9 PM and I dashed over to the Internet place to finish resending the zip files, and find that AOL has shut me off again - Incredible. Earlier in the day, I had reached Dr. Alfonso Dominguez to give him his disk. He is the President of the Spanish Society of Ophthalmology (like the AAO) as well as the ophthalmologist to the King and his family. He picks us up at 10 PM for dinner, after he finishes his late clinic hours. While driving us to the restaurant he tells us interesting stories about his parents during the Spanish Civil War. His parents were from Vigo in Galicia (where things were quiet) and his father was a doctor and thought it important to move to Madrid to get established. No sooner did they arrive when the Civil War broke out with shooting in the streets. She took the kids back to Vigo until it was over and he stayed there. He also told us about El Cortes Ingles (the largest department store all over Spain) and how it was started by Spanish guys from Cuba. He treated us to a wonderful dinner at Golzeko Kabi on Comandante Zorita which is a Basque restaurant. We had several different pintxos each with shrimp and they were delicious. This was followed by beef rouselettes for each of us then postres of "vision of chocolate" for Marcia and arroz con leche in pastry shell for me, ending with a cortado. I gave him the HP disk and he drove us back to the hotel by 2 AM. He is a very delightful man and a real gentleman. I did computer photos until I went to bed at 3 AM. The next day is Columbus Day or Discovery of America Day which is a very big deal in Spain. This day there was a car bomb in Colon (Columbus) Square by the ETA but there were no injuries. I awoke at 1 PM and by 2 I went to the internet place and sent Chapter 41 and did email for 1 hr. At 4:30 Marcia and I walked Plaza del Sol and for the first time caught the subway and got off at Atochia. We then had to walk down the Paseo de Prado to the Fountain of Neptuno (photo) and at 5 we entered the Museo Thyssen-Bornemisza which we explored for 2 hrs. They had some really great stuff in there and it was worth the wait in line. Afterwards when we hit the street we had to walk in the rain back to Atochia and get the Museo Reina Sofia where they keep the great Picasso painting called Guernica which is about the bombing of the Basque city of Guernica by Hitler's Nazi Air Force as a "test run" for the Blitzkrieg. He said he did it to help Franco but you decide. The place is huge I we got our exercise trying to cove the whole thing from 7:20-9:00. While I was there, Dr. Angel Castro returned my call and said he was in Toledo hunting small birds and would return to Madrid on Sunday so we can meet and I can give him his HP disk. He also recommended two good restaurants to go to for dinner. We left there in lighter rain and caught the Metro subway back to Plaza del Sol and walked in the rain to our hotel. I went to the internet place and discovered that AOL had shut me off once more. At 10 PM, I did my run heading for the Palacio Real again and as I am crossing the Plaza Dimitrii called me on the cell phone while I was running. As I was talking to him the police started yelling at me because I was crossing a police line that was in front of the Palace because the King and his entourage were leaving a holiday event they had had. I got out of the way and decided to call Dimitrii back later. I went on to the Plaza Mayor to try to find Sergio one more time. This time I actually asked someone if they knew where it was and they showed me that it was just outside the square and when I finally found it I realized I never would have without asking. I went inside but Sergio was not there. The girl gave me his cell phone number and I went back to the hotel. I called AOL ($15) to get turned on again with new password. What a pain. At 11 PM we walked to Plaza Santo Domingo to catch a cab to Dr. Castro's recommendation, Restaurant Hevia on Avd Serrano. We find Sebastian who was operated on by Dr. Castro (LASIK). I had eggs/potatoes/mushrooms which is a specialty and Marcia had gambi ajeo again. We both had solomillo beef, some cava and for postres Marcia had cava/lemon sorbet with pacharán and I had torte de casa which wasn't bad. We took a cab back to the hotel and got to bed at 3 AM. I woke at 8:40 and went down and got a cortado and did some diario from 9-11:15 in the lobby. At 11:15 I walked over to the Palacio Real and got into a very long line to get in. Amazing the other day I could have walked in with ease. Marcia stayed in the room and passed on the Palacio. The line finally moves and after going through emptying all my pockets for the security check, I toured the entire place from 11:50 to 1:30. I have to say that in my opinion it is the grandest place I have ever set my eyes on anywhere in my travels in Europe and I have now seen a lot of palaces. By far this is the grandest and a place you could actually live in. I can't express how impressed I was. After the tour of the ancient Farmacie, the rooms and the Armory (absolutely beautiful how they set the armor up with the men and horses) I took my new password to the internet place at 1 PM and sent of Chapter 42 and answered email. At 2 PM I got back to the hotel to meet with Murcia and Marcia. Murcia is the daughter of Dr. Fernando Morales's relatives Pepe and Fatima in Madrid. They were out of town but Murcia wanted to come by and say hello. It was very sweet of her and she was a lovely girl (photo). At 2:30, with the car back in perfect shape we headed out for El Escorial which is 45 mi northeast of Madrid. Marcia drove it to the San Lorenzo Monastery (photos), and we did a tour of the Picture Gallery, the Tombs of the Kings of Spain (photo) including the tombs of the royal babies that died (legitimate and illegitimate), the Royal Palace, and the Museo Architectoro. We were done by 5:30 and Marcia then drove to Segovia (30 mi) and got there at 6:15 to shop souvenirs like all the Spanish tourists around us. We then went to go inside the Catedral and found we had missed closing time by 10 minutes and they wouldn't let us in. They're tough here on these closing times no matter how I plead and bat my baby blues, they always say NO. So we then walked down the hill to the Alcazar at 7:00 to tour the old castle, it's Palace, Library and Armory and by 7:30 we walked back to the car and I changed in the car (for the 1st time) and went for my run through the central upper square (photo) and down the hill to the Roman Aqueduct (photo) which was built in 100 BC. In a few years they will start using it as a real aqueduct again - amazing. I then went up the very busy streets that were so congested with people I couldn't move let along run so I turned and went another way. When I was done I called Marcia on the cell phone to find out where she took the car. We met at La Colonial where she was having tea. While we were there I got a return call from Sergio and he told us he would meet us at his restaurant at 10 PM. So we left at 9 to drive back to Madrid the 65 miles (Marcia) and parked the car and then walk to Plaza Mayor and to El Cuchi to meet Sergio Durazo (Dr. Durazo's brother). He was just great. He told us how he is one of 7 kids and he is the only one not married. Two of his brothers are doctors. They are all from Mexico City and he came here to open this Mexican restaurant (Mexico City not tacos & burritos). The place was jam-packed and really hoping. John Eales would have loved it. He then treats us to dinner of Mahao (Spanish) beer, cava, tinto, tuna dip with chips,4 quesadillas (not like we have ever had), and a special dish called Molcajete Azteca (chicken, beef and lots of other things cooked in a large black lava stone pot covered with cheese that they bring to the table (photo). We ended with a cortado and pacharán, got a tour of the place and then headed back to hotel arriving at 2 AM and got to bed at 4. I woke 10:30 and got up 11:30. I walked to the Catedral for Mass at noon and at 2 had two caps inside at the La Botilleria while doing my diario. A couple sat nearby with a baby and a 6 year-old boy. The boy wanted to look at my computer as I was writing and I told the parents it was OK (because they were obviously telling him to leave me alone). When I got up to go (after they had left) the waiter tells me that the man had already paid my bill. Its things like that you don't forget. Got back to the room to help Marcia get packed after 6 days in one place (unusual) and at 4:PM we checked out of the hotel and left our bags there. I had found the card of Dr. Pablo Bohorquez who Dimitrii told me I had to call when in Madrid. Even though it was the last day I put a call to his cell phone. 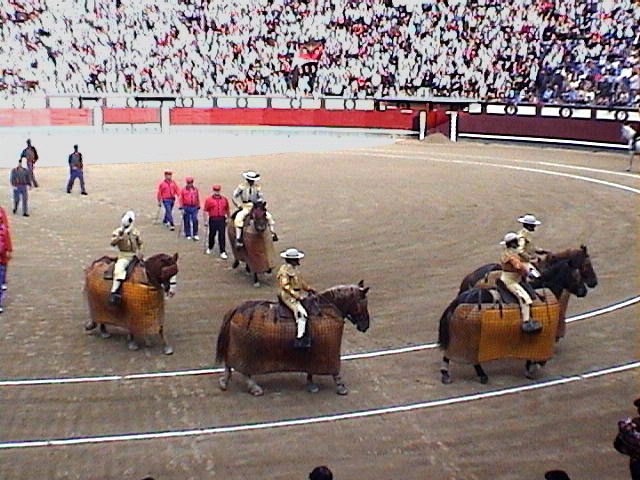 We then took a cab to Plaza de Toros for our first time to see the bullfights in the best place in Spain to see them. It was quite an event. You would think it was a Raider game at the Coliseum. We rented the little cushions (like everyone else seemed to be doing) to sit on and are we glad we did because the seats were concrete. We had excellent seats (on the 50 yard line) and just below the King's box (on the shady side). The weather was absolutely beautiful. 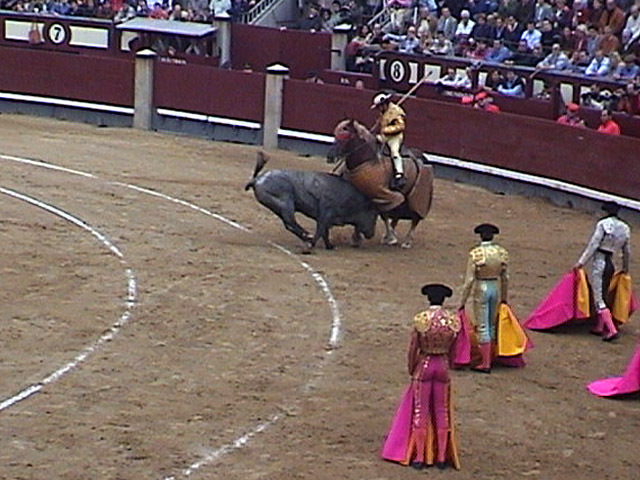 It is hard to describe this bullfighting thing other than to say it is deeply rooted in the Spanish culture. The bull is meat we eat at our table and we don't ask how it was killed. 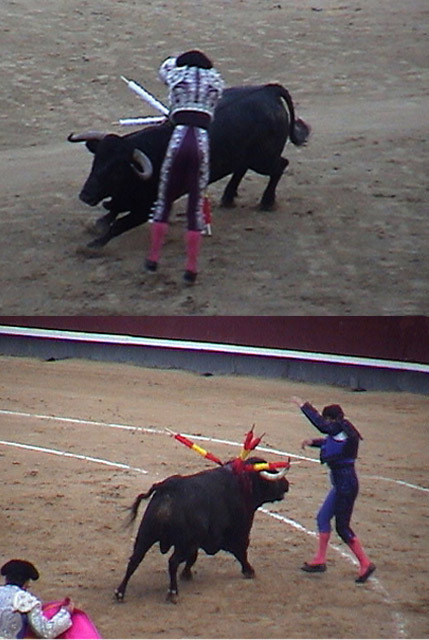 Yet for some reason something bothers you to see them stick the spikes in the bull and it changes from a beautiful ballet to a slaughter of a doped up animal. We wanted to leave after they dragged the 1st carcass off the field but wound up staying for two more. I was photographing so I really wasn't a spectator, see. I felt very weird and so did Marcia, so we finally left. We are glad we saw it but really have no interest to go again. We would if we had to and are really not against those who really enjoy it. While in the stands I get a call from Dr. Pablo Bohorquez who tells me he wants to meet me and will pick us up at the arena near the Metro station in 20 minutes. Since I have to Angel I figured I had better call him and see if he would like to meet Pablo or not. He said he would prefer not. Now what do I say to Pablo? We had a cortado at Pub Belon across the street and I tried an Internet machine they had in the bar but it wouldn't sign on to AOL so he gave me my money back. We then waited at Metro until Pablo arrived to pick us up and I told him I had to meet Angel alone. He drops us at the hotel and waits for me to get done. I meet with Angel who was waiting for me at the bar and I gave him his disk and we chatted for a while until Marcia interrupted to say we had to go. Angel had to leave also so it worked out just fine. We got the bags in the car and I ran back to say goodbye to the guy that treated me so nicely at the internet place (Angel, also) and then we drove in tandem with Pablo to pick up his German wife, Uta because they decided to take us to dinner in Toledo which is where we were registered to go next. Amazing.